It’s fall! The days are shorter and the nights are cooler. The trees are turning yellow, red, and yellow, giving a colorful salute to summer. Squirrels are scampering to gather nuts to store for the winter and Thanksgiving is just around the corner. This month your kids will go nuts for the squirrel crafts, activities, games, and resources that we’ve gathered for you. Talk with children about what squirrels eat, such as nuts and seeds. Ask children what kinds of nuts and seeds they like to eat. Nuts and seeds can be eaten as a snack or as part of a meal. They make tasty additions to fruit or vegetable salads, casseroles, breads or muffins, oatmeal, pilafs, and meat dishes. Nuts and seeds in general are very nutritious, providing protein and many essential vitamins, minerals, and fiber. Nuts and seeds are also high in carbohydrate and oils, so they should be eaten in small amounts. Warning! Some children are allergic to nuts. Make sure to check for food allergies before serving nuts to children. Read to children Nuts to You, a story about a city squirrel who digs in window pots overflowing with flowers and vegetables, does gymnastics to steal seeds from the birds, and begs for a treat at an apartment window. After reading the book, ask children what they now know about squirrels. Explain to your child that although animals cannot “talk,” they are very good at communicating. Talk about how different animals communicate with each other. For example, bees dance when they find nectar, chimpanzees greet each other by touching hands, and horses rub noses as a sign of affection. Ask your child to think about how squirrels might communicate ideas like “go away” or “I’m afraid.” For example, it might flick its tail to tell other squirrels to leave its food alone or might make loud chattering sounds to indicate that it’s scared. If possible, go outside with your child and observe squirrels in action. In the fall, squirrels are busy gathering and hiding nuts for the winter. 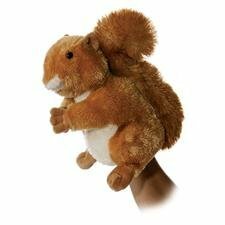 Have children pretend to be squirrels gathering and hiding nuts while you sing a fun song about a little squirrel.